My only problem with the whole movie is they cast an actress or color as a point of diversification and cast a Caucasian actress as the Huntress which is a character of color. It just makes no sense at all. I totally agree. I do NOT get why they thought it was a good idea to cast the black girl to play this role simply because the character's name is "Black" Canary. It seems WAAAY reductive to me and a tad bit offensive/racist. When did Huntress technically become "a character of color"? She's usually been of somewhat Italian-American descent in the past, hasn't she? Grayson/Rebirth Helena Bertinelli, where she was meant to be depicted as an Afro-Italian (I think?). I think WB is in talks about a lot of solo movies . You finally realised that huh ? congrats. I always thought it was because Margot Robbie took part in the casting process since she's a producer on the movie and probably just didn't want to have another hot blonde on the team. Not that Harley Quinn should have any business being a BoP member, let alone a founding member, but if they were not going to go with the New-52 version of Huntress, they were left with two blond white women on the team. I'm guessing Margot just didn't want that. At least those are my speculations. Last edited by Johnny; 02-11-2019 at 09:47 AM. There are some people who have tan / tinted skin who would not necessarily be considered "non-Caucasian". Referring to those people as "people of color" would be making it sound like they're a minority the same way that a person with red hair is a "minority" simply because their hair color isn't as typical as black hair / brunette hair / blonde hair. Should "person of color" refer strictly to pigmentation without taking into account heritage? As costumes go, this rates a solid "meh" from me. I can understand ditching the fishnets, but Black Canary has always had a biker, trucker, or mechanic sensibility to her. The materials are simply too nice here. The flared pants also feels off—I think a solid pair of boots is important to her character. The top is way too small, and why is it yellow? The jacket ought to be short, not the full-length shown here. The jewelry also feels very un-Dinah to me. She should never be afraid to get her hands dirty. As others have said, I highly doubt this is her "costume." Looks like civilian attire to me. 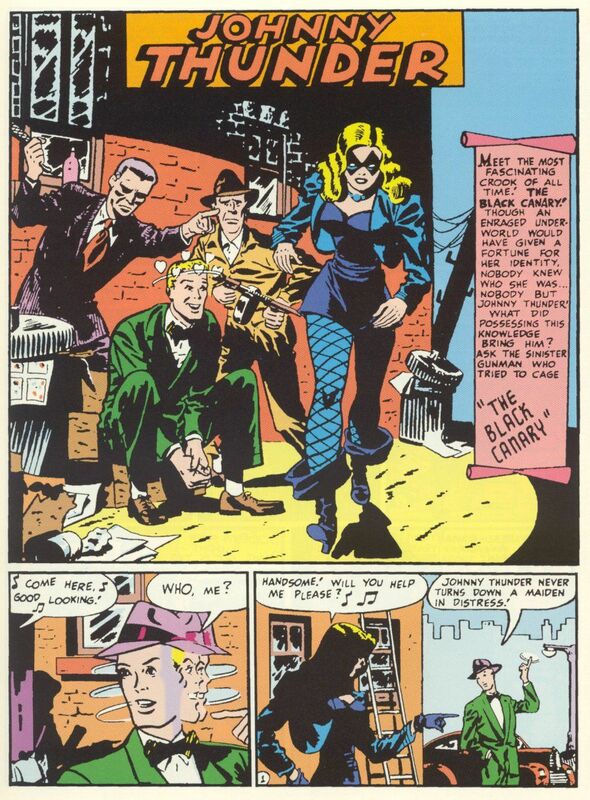 And while yes, Black Canary's initial look came from the old "biker chick/ bad girl" aesthetic, times change and that image doesn't mean now what it used to mean and for a young woman to adopt that look in the 21st century says something different within the current cultural context. These characters that have been around for more than half a century need to be adapted for modern times to reach a larger audience. Hopefully, however they interpret the modern "bad girl" that Dinah is in this adaptation fits her better than the version they tried in the "Birds of Prey" tv show. And I don't see how the face-jewelry is less practical than her wearing her long hair out or wearing a choker. A great and more modern adaptation was Injustice 2. Her look and attitude and even her walk were also very on-point. When Dinah told Bruce that she was sticking around this time because she couldn't be there to take down Superman gave me chills. Last edited by Keyotheseasons; 02-11-2019 at 11:38 AM. Her Rebirth costume would also probably be pretty easy to adapt into live-action. As costumes go, this rates a solid "meh" from me. Sofar all of the pictures from the BoP movies I have seen were kind of meh, and non of the characters looked like their comic book counter part. Perhaps that's a blessing in disguise . . .
. . . And while yes, Black Canary's initial look came from the old "biker chick/ bad girl" aesthetic, . . .
How common was the "biker chick" aesthetic back in 1947? Yeah, "biker chick" is still pretty gods damn common. Anyone who thinks differently has apparently never gone to Bike Week. I got no issue with Dinah wearing modern fashion, but I still want that to be an accurate reflection of her character. What the actress is wearing in those images is a little too "pop music" when it should be closer to "classic Metallica" yknow? But again, who knows? Maybe they'll do right by Dinah. We cant say one way or another from a few random photos without context. I mean, I wouldn't bet on them getting her right, but that's because the DCEU has screwed up too often for me to trust WB. But we dont know.